The Biltmore Greensboro Hotel has a storied past. The building was built by famed architect Orlo Epps for Moses and Caesar Cone. 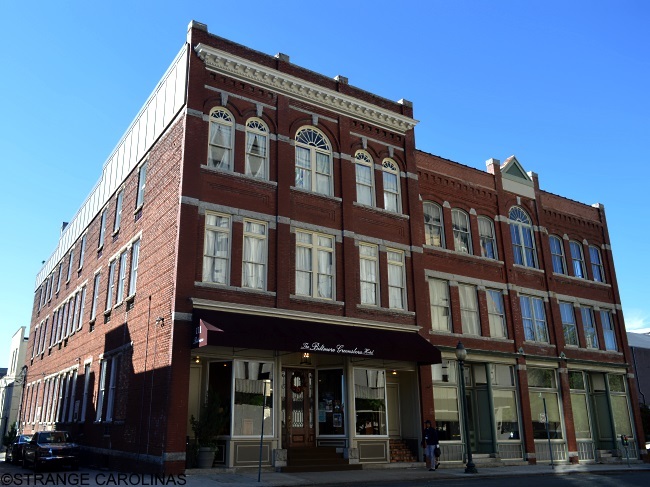 It was the first building in downtown Greensboro completely wired for electricity and faceted with indoor plumbing, and also the home of Greensboro's first automatic electric elevator. In the 1920s, folks claim it became a brothel run by a widow named Ava Taylor. 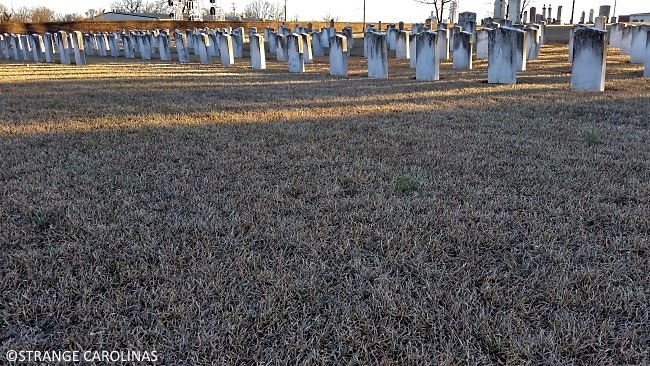 Over the years, several people have died there, and maybe one or two were murdered there. There are numerous ghosts roaming the halls and rooms of the Biltmore Greensboro Hotel. 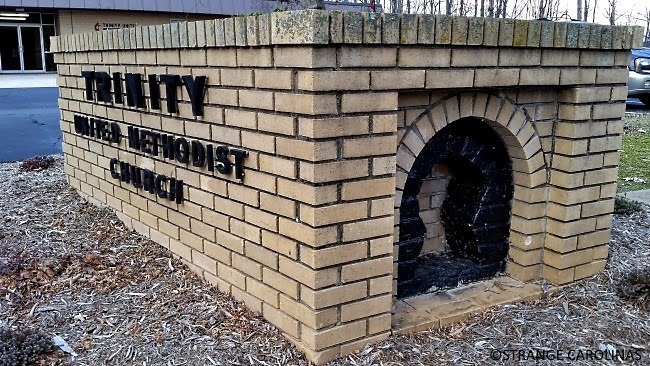 Which is stranger: the fact that a man made a giant keyhole so that witches could escape his house or the fact a church now owns the keyhole and keeps it in a planter? 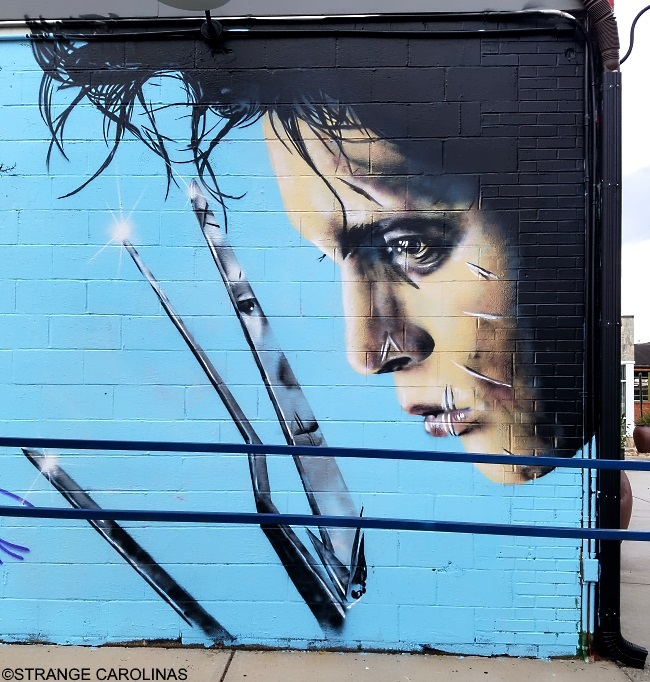 Are you a fan of Johnny Depp, Edward Scissorhands, or both? Then you need to check out this awesome mural in Charlotte! 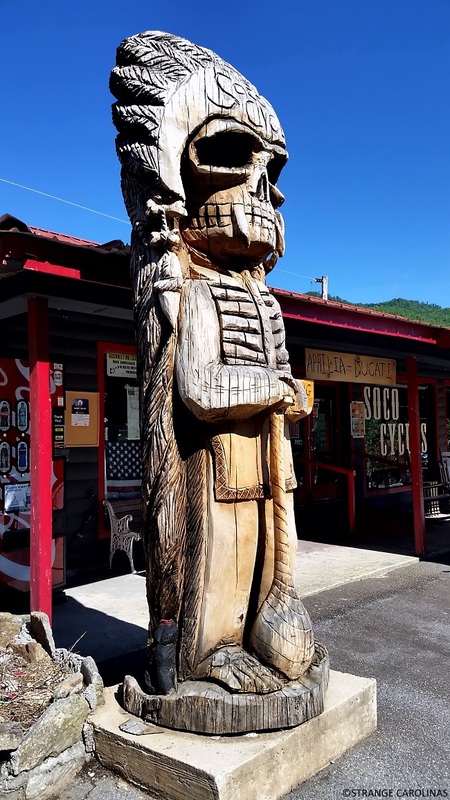 This death statue outside Soco Cycles is sixteen feet tall and named Maniac. We're at the grave of Benny and Billy McCray, known professionally as The McGuire Twins. They were professional wrestlers and held the Guinness Record for "World's Heaviest Twins," tipping the scales at nearly 1500 pounds collectively. They were also often photographed on their Honda motorcycles. James A. Reid had his foot severed by a freight train on November 25, 1893. His foot was buried here. 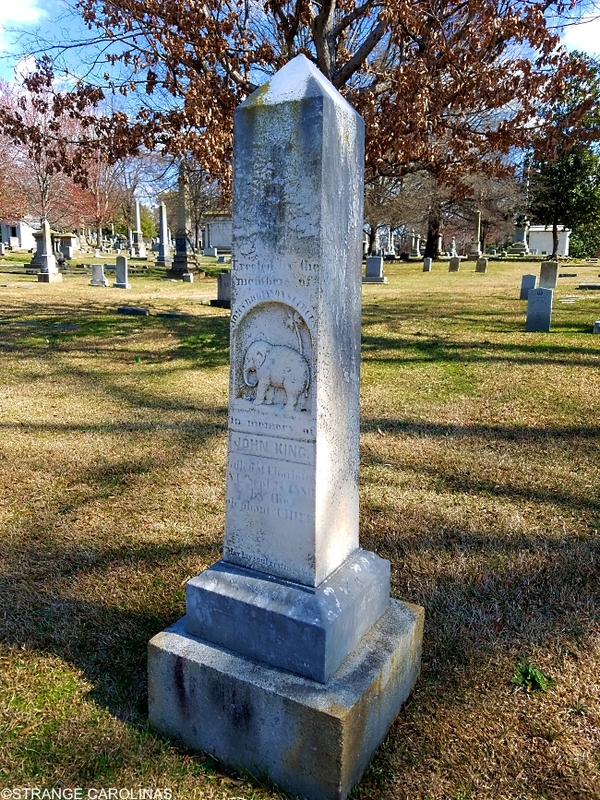 When he died several years later, the rest of Reid was buried seven miles away. 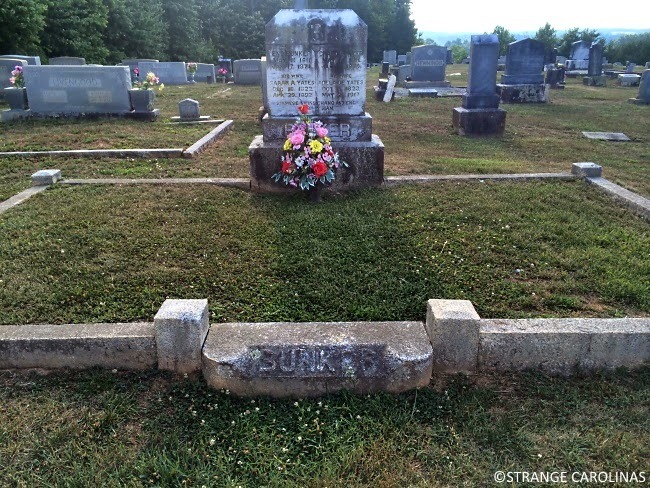 This is the grave for Siamese twins Eng and Chang Bunker, who are buried in the graveyard directly behind the White Plains Baptist Church in Mt. Airy. 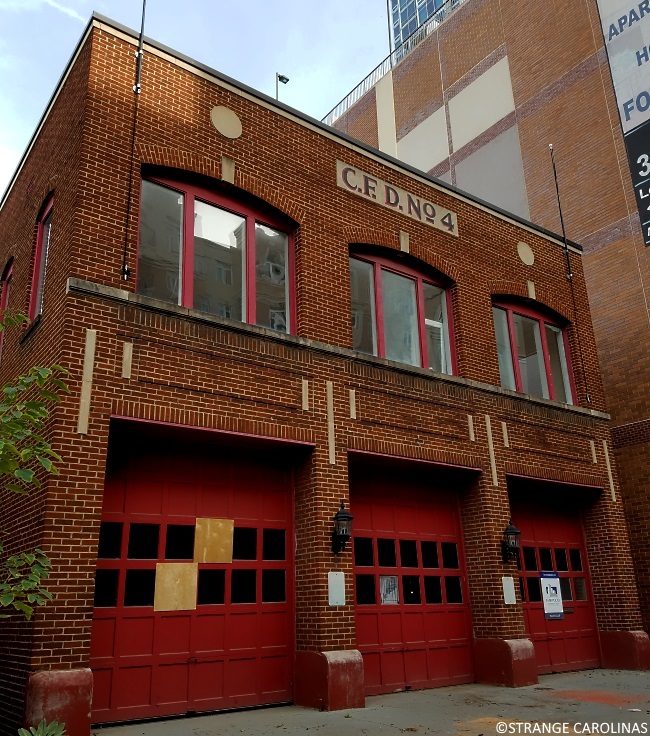 A former Charlotte fire station is rumored to be haunted by a firefighter who fell to his death in the 1930s. How do you know it's exam time at UNCG? 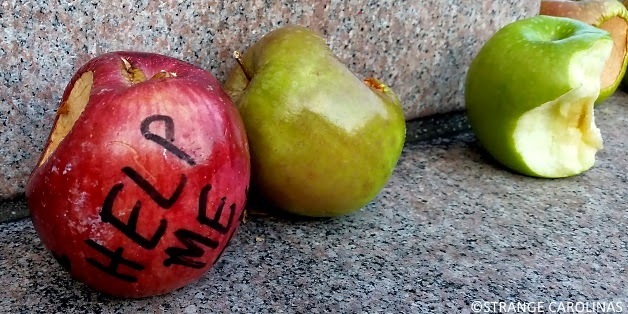 Students take a bite out of an apple and place it at the base of the Minerva statue in hopes of a passing exam grade. 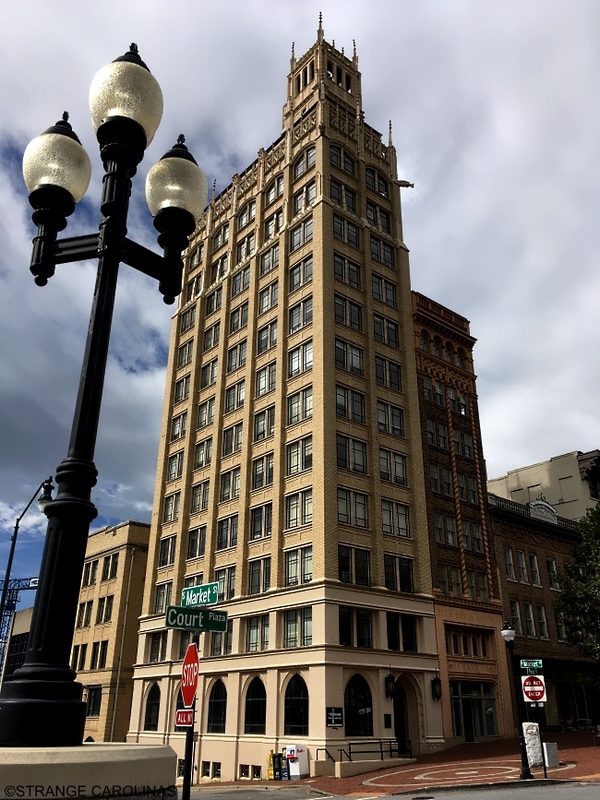 Asheville's Jackson Building was the former site of Thomas Wolfe's father's tombstone shop and the first skyscraper in western North Carolina. It's also haunted by a man who jumped to his death from the building on the day the stock market crashed. There's even a bullseye at the foot of the building to mark where he fell! 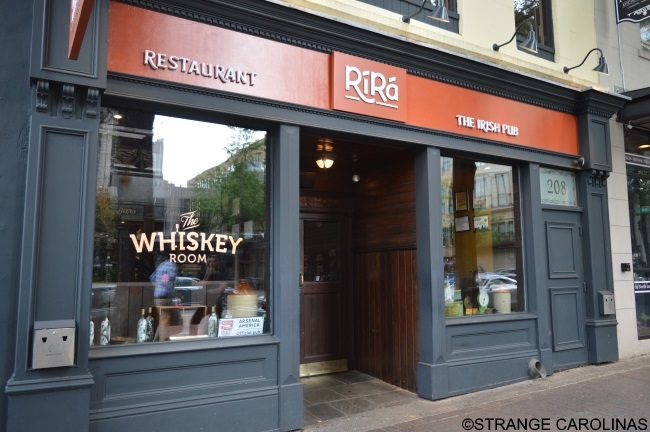 Charlotte's Ri Ra Charlotte Irish Pub is known for its whiskey, beer, and pub food. 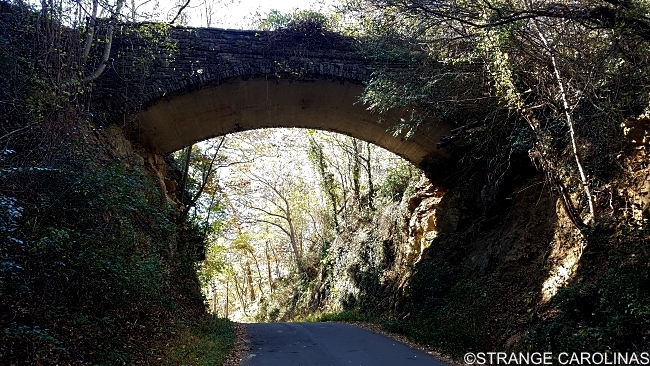 It's also known for its ghosts, including a man from the 1920s in uniform with white gloves and a pillbox cap, an elderly man with a dog and cane, and a girl who writes the alphabet on the pub's brick wall. She's dressed in a white gown. She asks you for a ride on a rainy night. When you arrive at her home, she's no longer in the car. You proceed to the door of the address, only to discover that she was killed years earlier near the underpass where you picked her up. 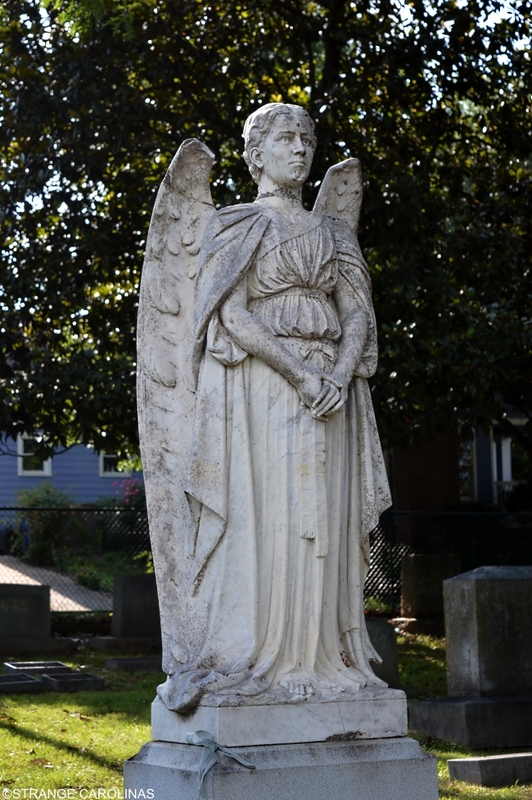 Lydia is North Carolina's most well-known urban legend. 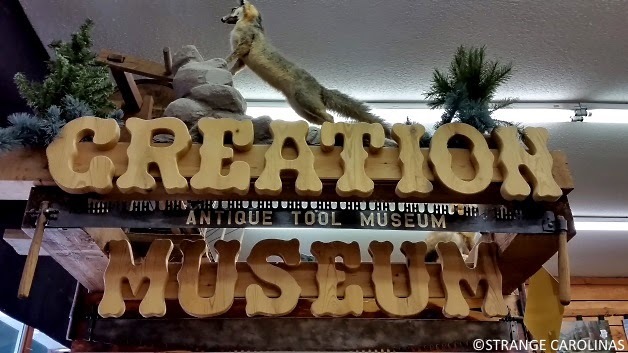 The NC Museum Of Creation/Taxidermy Hall Of Fame Of NC/Antique Tool Museum in Southern Pines might not seem like an obvious stop on our Halloween tour, but its abundance of taxidermied animals, bones, empty beer cans, antique tools, and Beanie Babies make it creepy enough to check out! 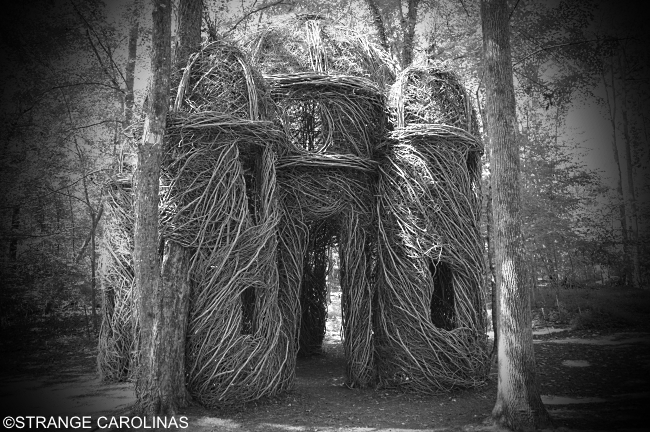 This is actually a piece of art by a respected artist, but because we're a bunch of rubes, we think it looks like the Blair Witch stopped making all those stickmen and decided to build herself a proper house with the sticks. 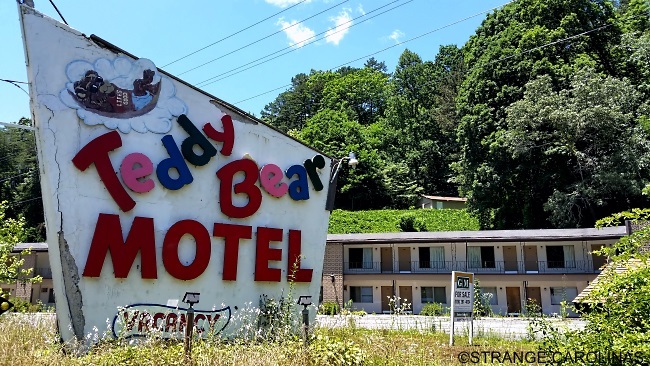 The Teddy Bear Hotel is so creepy they had to demolish it earlier this year! Did you know that October 20th was the 50th anniversary of the day they shot the infamous Patterson-Gimlin Bigfoot film? 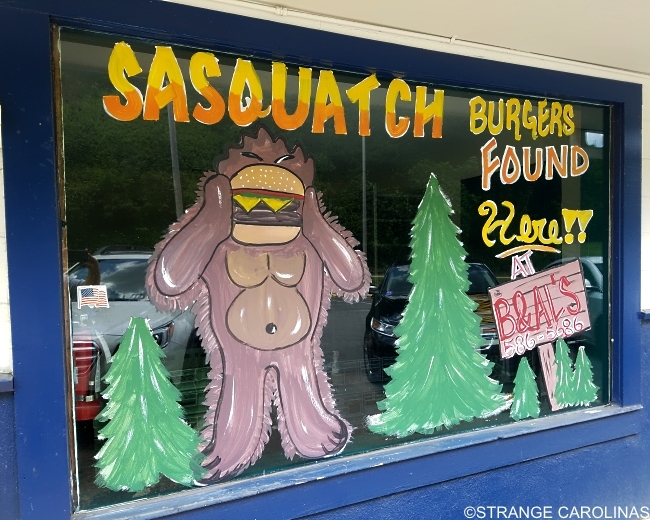 Go celebrate with a couple Sasquatch Burgers! 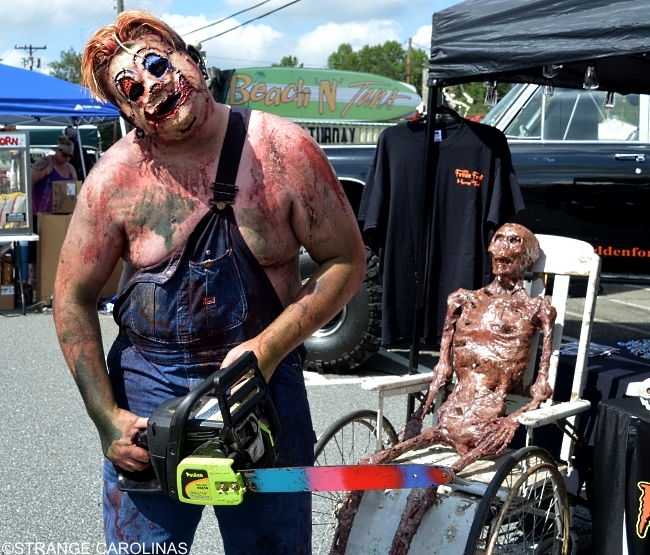 The Davie County Zombie Parade & Monster Fest is a parade and festival for all things spooky and scary. You've already missed the 2017 festival, but you should definitely check it out next year if this is your bag. And check out all the scary photos we took from 2016's festival! 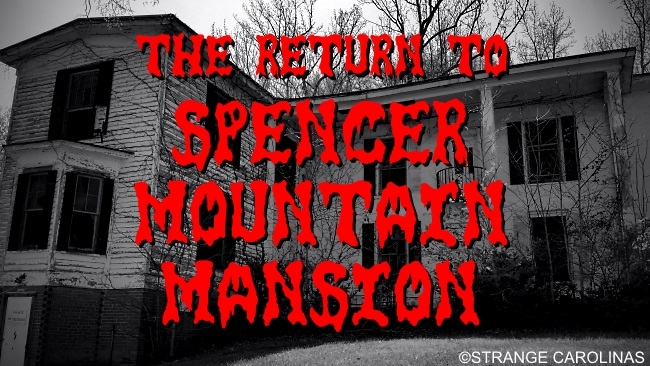 Ever since we first wrote about the Spencer Mountain Mansion, our readers have shared their own experiences with the Spencer Mountain Mansion. We have a collection of them here, including several photos of orbs seen outside of the mansion and one photo that appears to show an old woman/creature behind a group of teens. 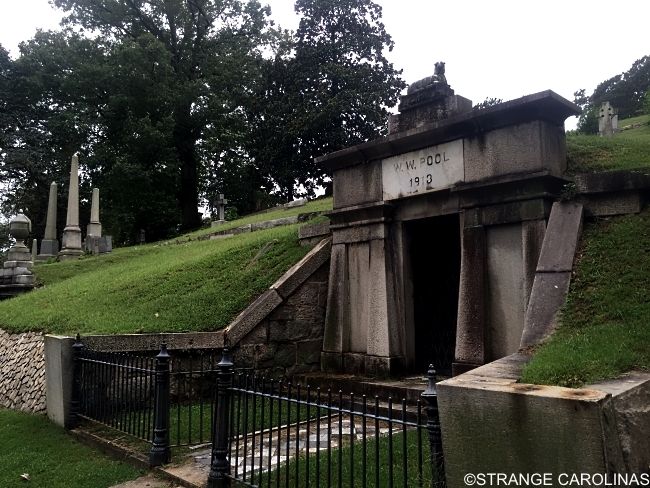 Richmond's Hollywood Cemetery is the final resting place for two former Presidents and one alleged vampire. 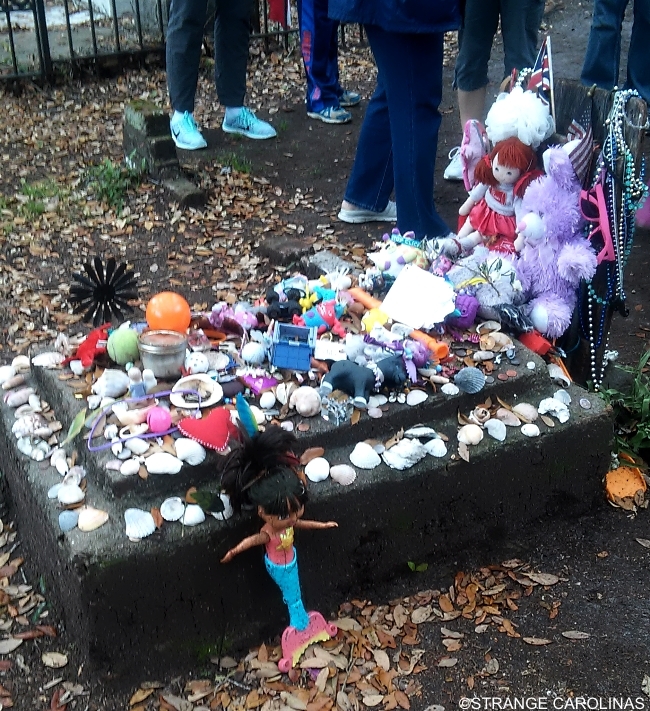 Two-year-old Bernadine Rees died from Scarlet Fever in 1862 and her grave is often found adorned with trinkets, toys, rings, flowers, and stones. 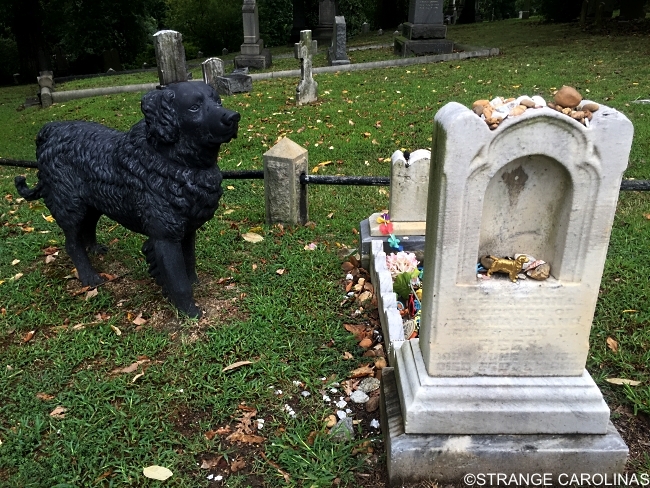 But what makes Bernadine's final resting place so compelling is that it is guarded by a black iron dog... That growls. 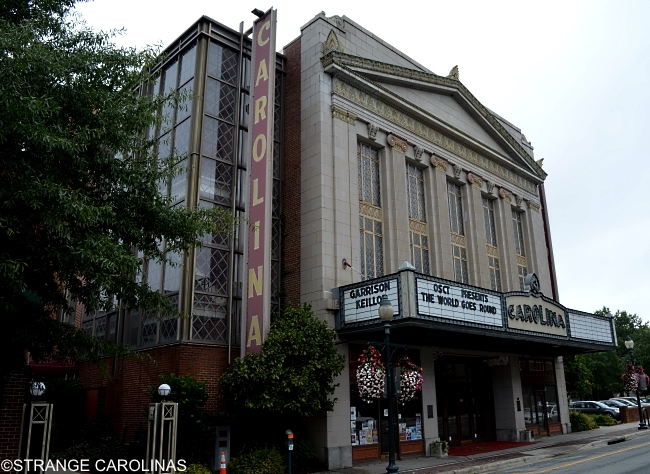 Last October, we were given a tour of The Carolina Theatre and told the history of the THREE ghosts that haunt the 90-year-old theater. 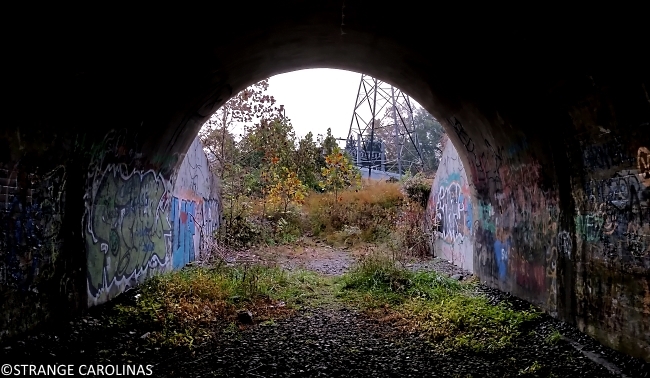 The Road To Nowhere might not be particularly scary, but there is something a tad bit creepy about a dark, graffiti-ridden tunnel that leads to nothing. 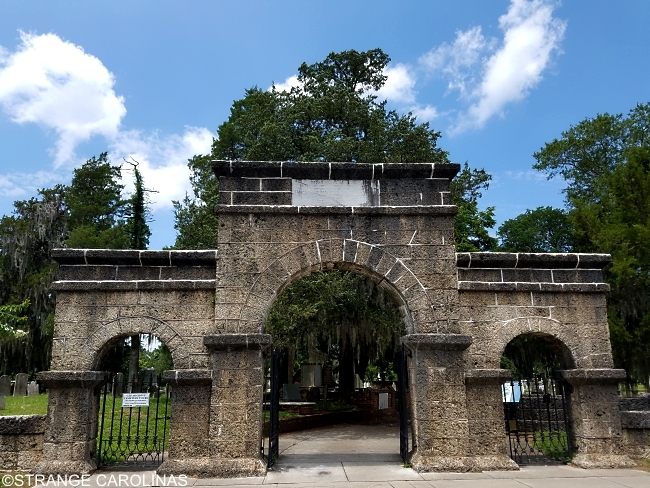 New Bern's Cedar Grove Cemetery is a proper spooky Southern cemetery with Spanish moss and graves that have been around for centuries. But it has one thing that most cemeteries don't: a weeping arch. And if it "cries" on you, you're the next to die! 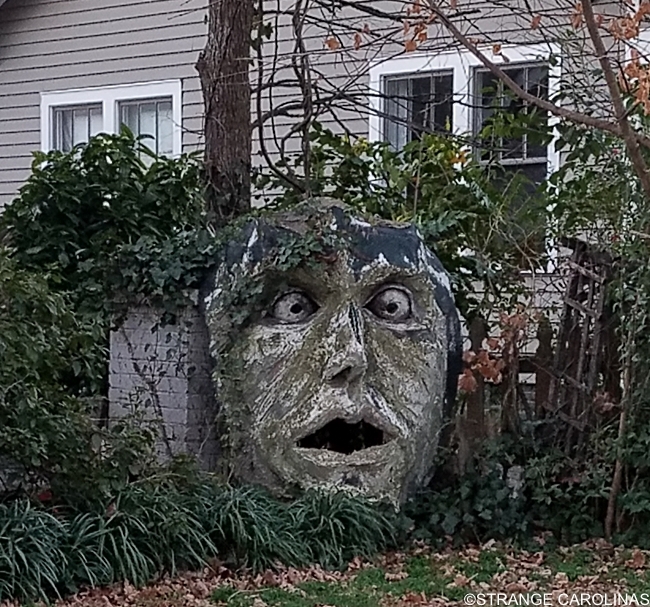 In the middle of a Charlotte neighborhood, not too far from Central Avenue, you'll find a giant creepy head. 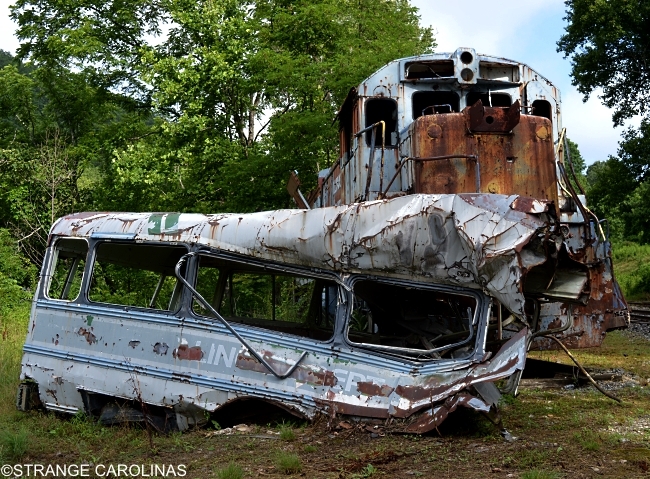 At the bottom of a ravine in Sylva, you'll find the twisted remains of a horrific collision between a freight train and a prisoner bus. 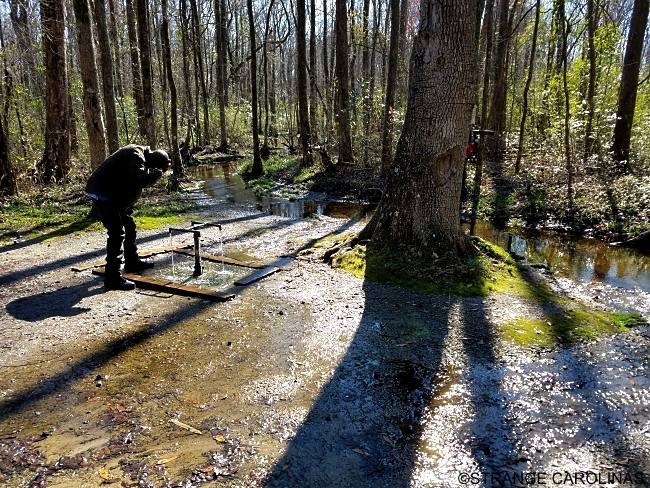 This location isn't scary or creepy, it's about a South Carolina spring that has mystical healing powers. And it's also owned by God. We tried some of its water. 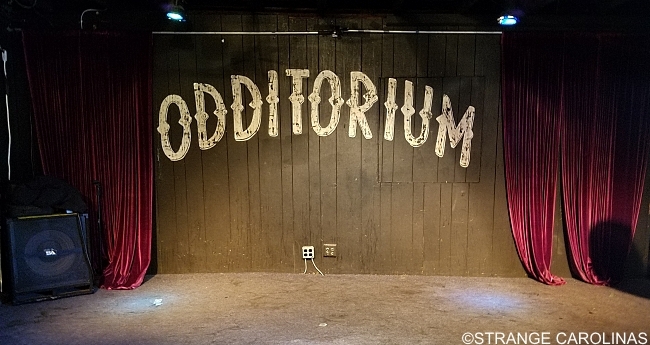 The Odditorium is more than just a bar. 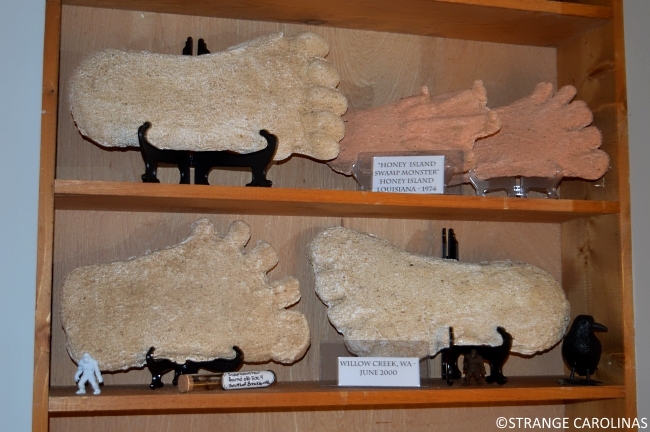 It's also a collection of oddities (many of which you can purchase) like a 17th century hairball, dirt from the crawlspace of serial killer John Wayne Gacy's home, Sarah Jessica Parker's autograph, and Amy the Possum Dragon. 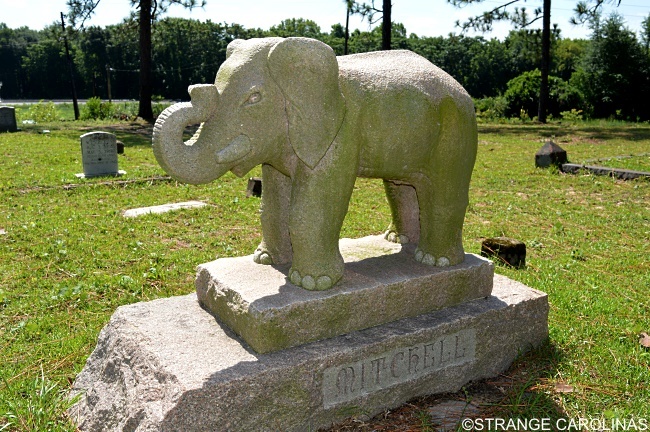 Do you know who or what is buried at this grave in Hamlet, NC? 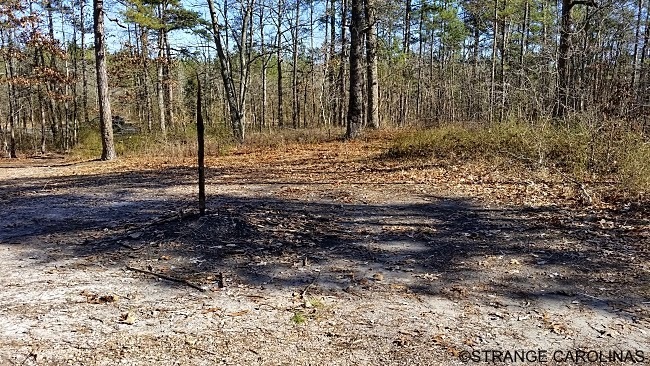 The Devil's Tramping Ground is a barren piece of land deep in the woods where nothing can grow, where no man can spend the night without losing his sanity, where an object put inside the circle before sundown will be outside the circle by sunrise, and where the Devil himself stomps around at night. We visited and you'll never guess what we found! 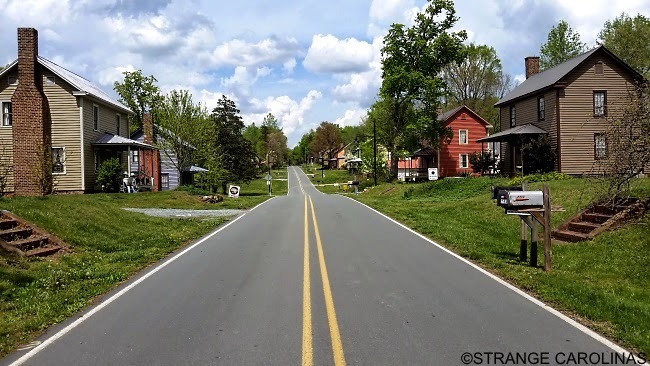 Growing up in Alamance County, there was a street with tiny, rundown houses on both sides. If you dared come to a stop on that road late at night and honk your horn, angry little people would come running out of the houses, throwing rocks and bottles at your car. If you didn't drive away soon enough, they would start rocking your car. It was called Munckinland. 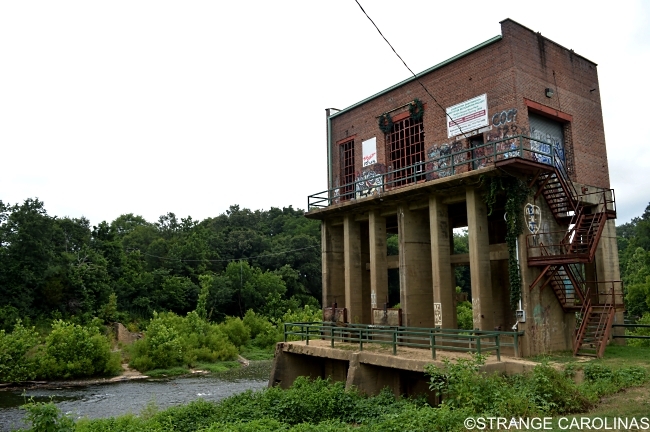 The Carbonton Dam powherhouse is not haunted. It's just one of those places that looks creepy as all get out. 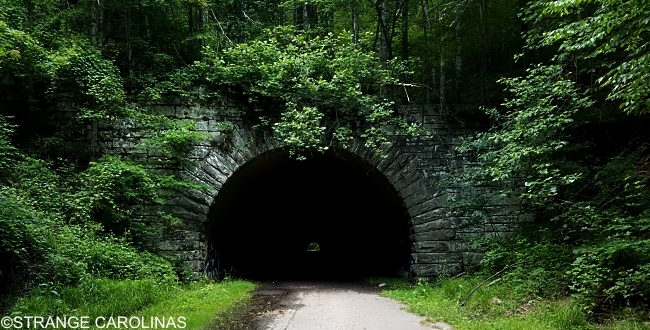 We've always thought it would be the perfect place to ride out the zombie apocalypse. 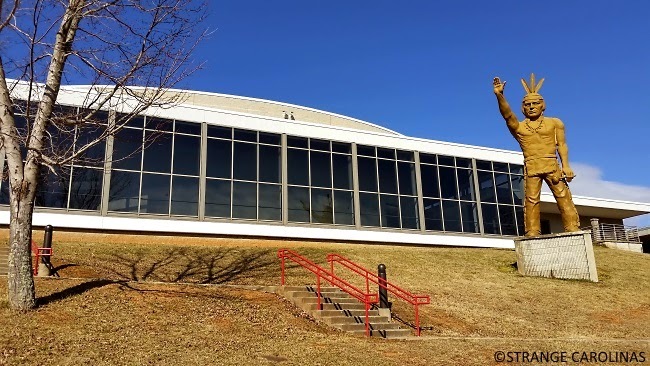 People say Asheville's Erwin High School is haunted. Custodians and teachers have reported elevators changing floors by themselves late at night, items being moved, the sound of boots plodding through the hall, pictures falling off the wall, and more. Why? Maybe it has something to do with the fact they unearthed 1,000 bodies when building the school. Remember the movie Maximum Overdrive, where all the cars and trucks and stuff came to life and tried to kill people? 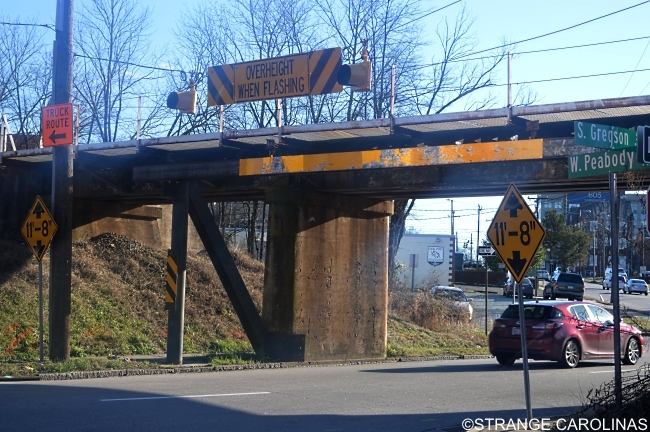 Emilio Estevez and his crew could've used a little help from The CanOpener, a Durham bridge that eats trucks. 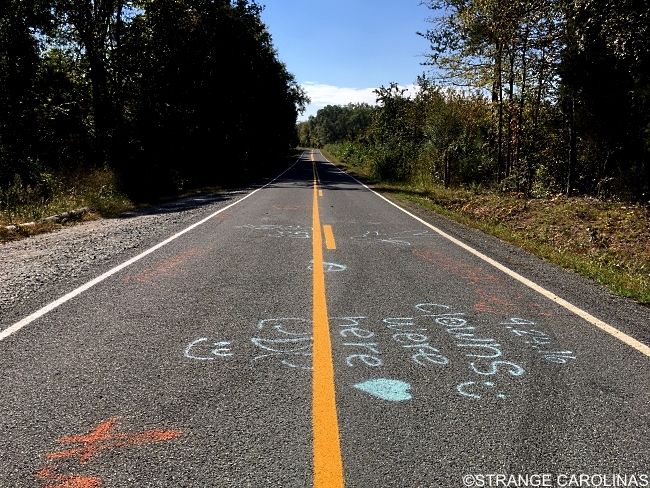 Gravity Hill is a hill in Richfield where you can stop your car and put it in neutral, and instead of moving backward down the hill, you actually move forward up the hill. We had to try it out. We even did a video of it! 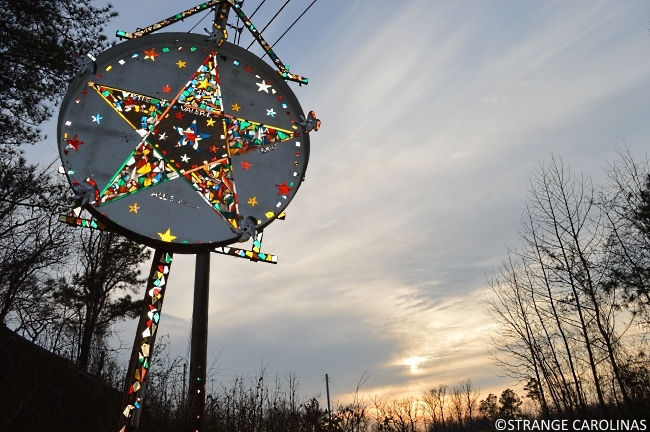 Acid Park is one of North Carolina's most infamous urban legends, intertwining LSD, teenagers, a deadly car accident, and whirligigs. It's also totally false. Sometimes monsters aren't hiding around the corner. 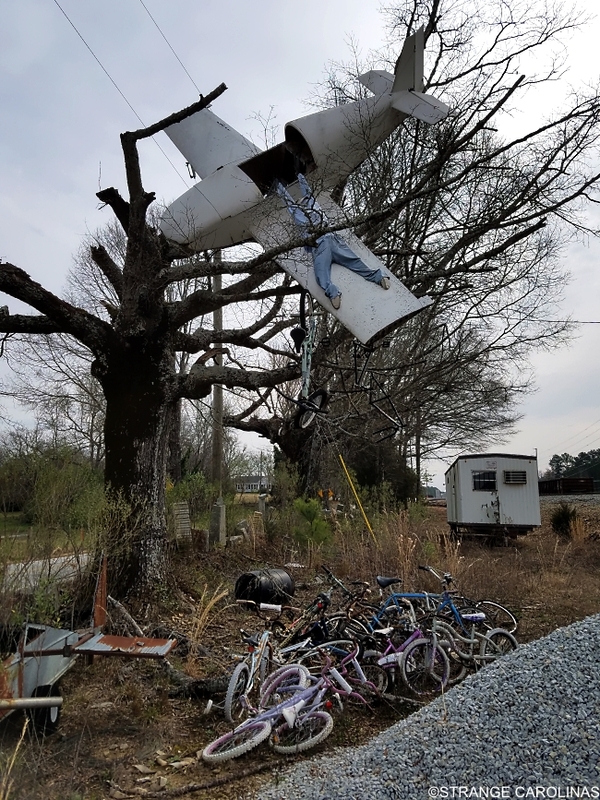 Sometimes they're coming from the skies. 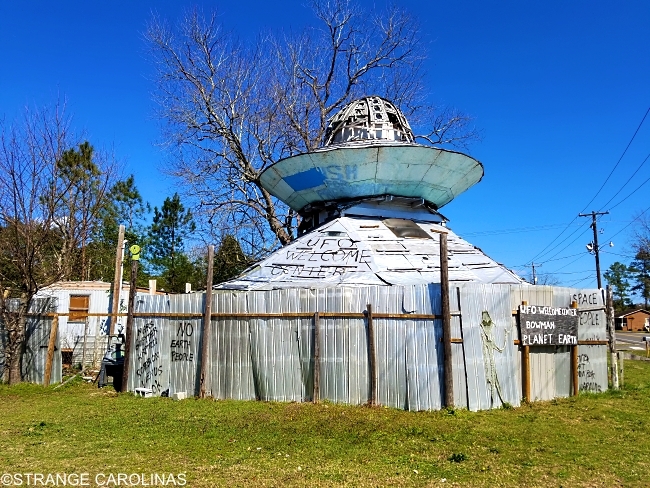 Lucky for us, Bowman's Jody Pendarvis has built a UFO Welcome Center and his own spaceship and is currently watching the skies, waiting for the aliens to return. 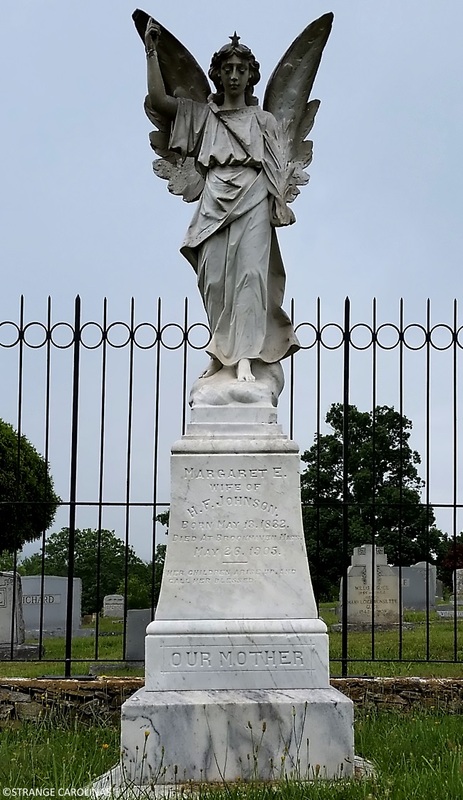 This angel, which marks the grave of Margaret E. Johnson in Hendersonville's Oakdale Cemetery, is mentioned several times in Thomas Wolfe's debut novel, Look Homeward Angel. 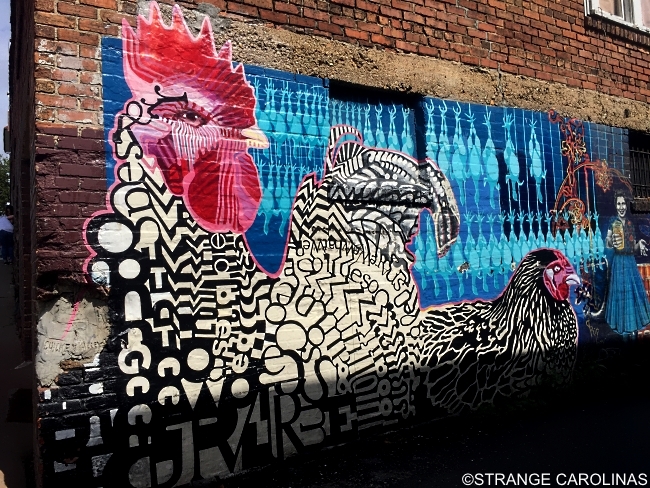 According to legend, people can sometimes hear hear the click-clacking of a cane in Asheville's Chicken Alley. It belongs to the ghost of Dr. Jamie Smith, who was killed in 1902 trying to stop a barroom fight. 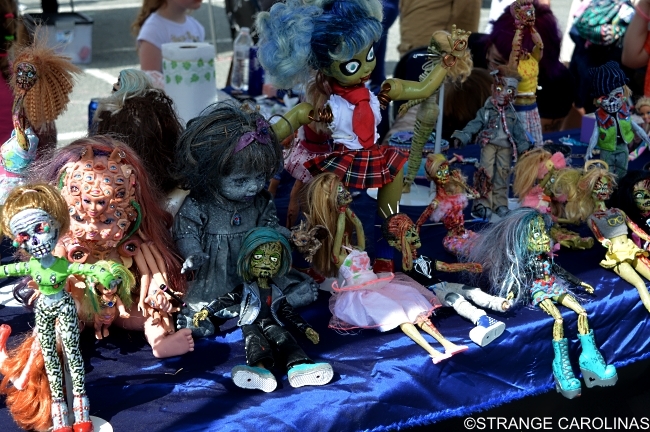 We interviewed Sarah Hensley who transforms Barbie dolls into zombies! 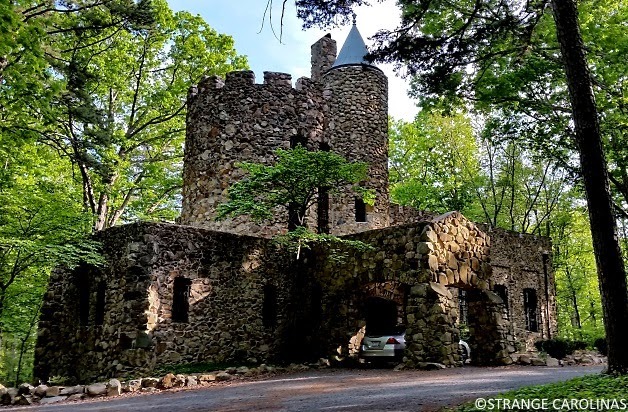 Chapel Hill's Gimghoul Castle could be home to a secret society, the site of an 1831 duel over a woman named Fanny, the bane of The Chris Gethard Show, or it could be haunted. Or maybe it's just a frat house with the word GHOUL in its name. You decide! Hungry? 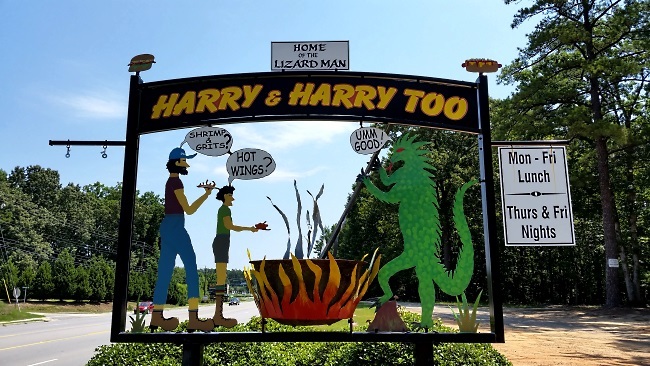 In Bishopville, Harry & Harry Too serves a Lizard Man sandwich, named after the famed Lizard Man of Scape Ore Swamp. In case you're wondering if the sandwich is made from lizards, men, or lizard men, the menu says it's just chicken. 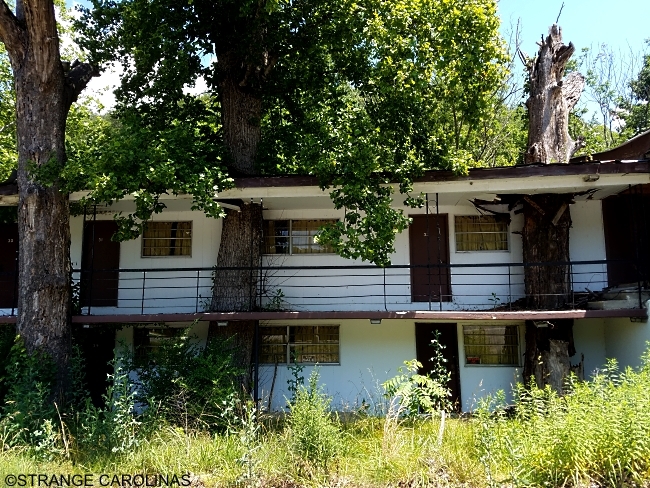 Helen lost her child from a fire at her nearby castle in Asheville. Not able to live with the grief, she hung herself from this bridge. Many have reported seeing a woman in the vicinity of the bridge late at night, wearing a white gown. We went looking for her. 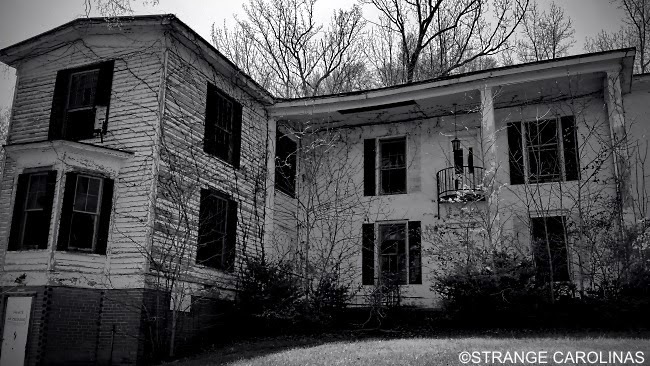 There's an abandoned mansion on Spencer Mountain that many think is haunted. We investigated. Do you like scary movies? Enough to build and live in a replica of a house from one? Kenny Caperton does. 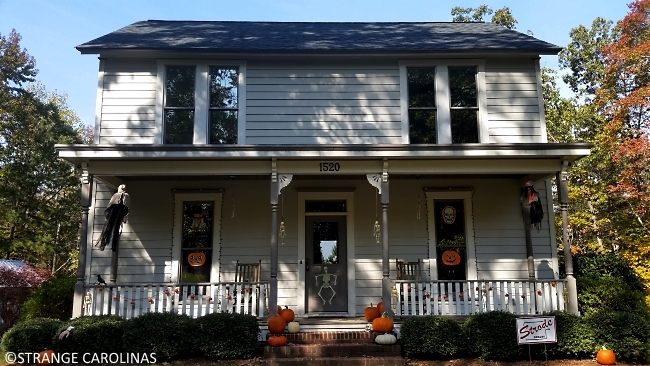 He built and lives in his own replica of the house from Halloween. 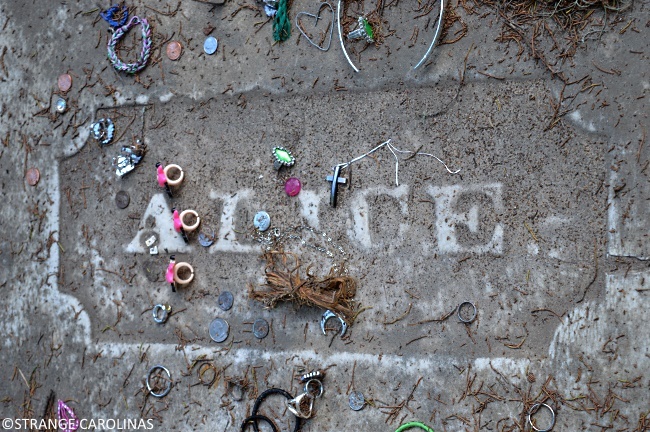 We visited the Pawley's Island grave of Alice Flagg and tried to make her ghost appear. Did it happen? Philip Morris died on September 24th at the age of 83. 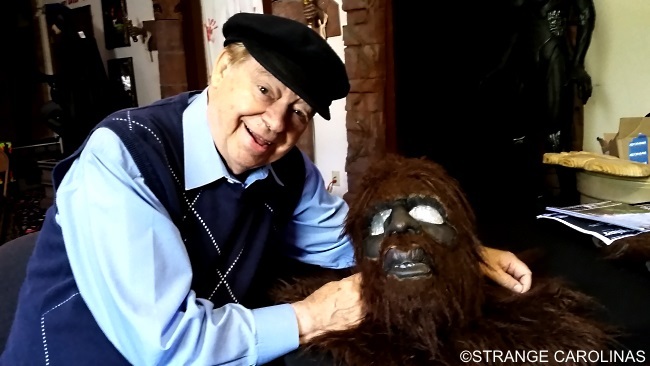 We interviewed him over two years ago, during which he told us he created the Bigfoot costume seen in the infamous Patterson–Gimlin film, which was shot 50 years ago this month.